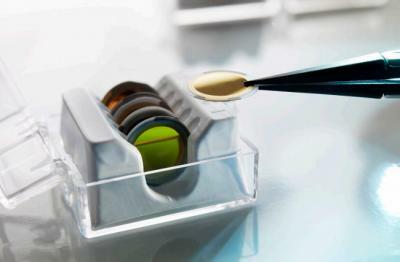 A graphene oxide (GO) sensor co-developed by the ICN2 Nanobioelectronics and Biosensors group has recently been added to the list products offered by Biolin Scientific, a prestigious instrumentation company devoted to the production of analytical devices. The Q-Sense GO sensor enables interaction studies of GO with various analytes (measured substances) of interest and may open the door to various applications with interest for diagnostics, safety/security and environmental monitoring. Biolin Scientific, a leading Nordic instrumentation company, develops products based on nanotechnology and advanced measurement techniques. The company has a line of instrumentation called Q-Sense, which deals with instruments that enable real-time analysis of surface-molecule interactions with nanogram precision for a wide variety of samples and measurement conditions. Biolin Scientific wanted to incorporate a graphene coated sensor in its Q-Sense sensors list. The collaboration between ICN2 and the Nordic company became plausible because the Institute already had expertise transferring graphene to the surface of interest. The ICN2 Nanobioelectronics and Biosensors Group, in collaboration with Biolin Scientific, used a quartz crystal microbalance containing patterned graphene, a system that measures mass variation. The device measures frequency changes of a quartz crystal piezoelectric resonator when it is disturbed by the addition of a small mass (DNA, protein, virus, bacteria, etc.) or any other tiny object to be quantified. The technology of graphene patterning, already patented by ICN2, takes advantages of wax-printing onto nitrocellulose membranes followed by filtering of exfoliated graphene and a pressing process onto any solid surface.